We are in the middle of a tour of Latin America where the gaming industry shows strong development and revitalization. There were two unforgettable days in San Juan, Puerto Rico during the 2014 CGS, with excellent conferences, where Andy Viera, Director of Gaming in Puerto Rico, put us up to date on the progress of the new legislation for the country that will include online gaming. Then we island hopped to Dominican Republic, where Gambee has just installed its popular electronic roulette at the Hard Rock Punta Cana Hotel & Casino, and where Amaya Gaming will soon be debuting a new product, which we will have as an industry news scoop in our B2B media. An now we are heading for Peru to visit friends, family, and great chums who no doubt will share with us delightful ceviche, some pisco sours plus a few ultra chulled chelitas, because the weather is still like summer in this my beloved Lima, and we have April round the corner! Also in April, we make our way to beautiful Colombia to take partin the most cheerful gaming expo in the world at FADJA 2014, in the dazzling Bogota, on 23-24. See you all there! Celebration Jamaica has announced that the ongoing bidding processes for the three crucial areas of operations, financing and construction of Jamaica’s first integrated Resort & Casino Hotel are close to conclusion after a 12 month assessment of tenders. Celebration Jamaica will be granted an exclusive Casino license for the parish St. James and is ready to begin construction of 1000 hotel rooms, which form part of the first development phase, within the next 6 months. The US$500 million first phase of the integrated resort development will provide more than 2,000 Jamaican jobs and millions of dollars in tax revenue for the Government of Jamaica. The head of the Department of Casinos and games of chance, Dr. Rafael Jáquez Hernández, reported that the Ministry of Finance continues to work to establish modern standards to regulate and supervise the companies engaged in the activities of casinos, raffles, bingos, charity raffles, slot machines, benches of sports betting, Lottery and other games of chance. In a meeting held in Santiago de los Caballeros, to the North of the country, with executives from different business associations, Jáquez Hernández said that outdated rules that hinder the development of the referral business will be eliminated and highlighted the progress that is being made by the administration of Simon Lizardo Mezquita [left], Minister of Finance, to correct the problems that currently face these businesses. During the meeting, the Director of Casinos and games of chance warned that they will continue operations, throughout the national territory, to close businesses that operate illegally. At the same time he answered questions, complaints and concerns of the participants at the meeting, guaranteeing that they will keep in constant communication with the management of the associations and entities that make up the companies in this industry. At the meeting were present, among others, representatives of casinos in the Hotels Grand Admiral, Matum, Platinum, Aloha Sol, Gran Victoria and Magic. In addition were the Presidents of associations from betting venues in different cities of the northern region, including the hosts in Santiago de los Caballeros. The Superintendence of Casinos reported that the Ministry of Finance has confirmed the reappointment of Renato Hamel Maturana as Superintendent, who was chosen through a public contest developed by the National Directorate of the Civil Service. The Superintendent thanked the new authorities for the confidence shown in him and stated that the decision reinforces the commitment from 2012, since it allows continuity to its management. Among the main challenges for this year, he named the 2014 process for granting an operations permit for a Casino that is currently being conducted and that ends July 30. 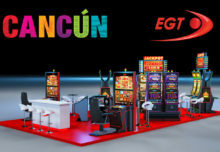 AGI Gaming Colombia is Platinum Sponsor of FADJA 2014 and has taken a very large expo area at the sixteenth edition of Latin America’s most representative gaming show that will take place on April 23 and 24 in Bogota. Industry leaders will showcase the latest products for casinos, slots operations, bingos and lotteries for the regional gaming industry. In Colombia the Government is advancing with modern plans to regulate the gaming industry, specifically by implementing the online slots interconnection process. Coljuegos, Colombia’s gaming regulator, is key to the proposed changes and current sports betting tender that will see major changes in the country’s gaming sector. As investor interest on sports betting products and services as well as internet gaming gathers pace, FADJA 2014 is preparing a Business Round Table on the betting sector, where there is already the confirmed presence of Colombian, Venezuelan and Peruvian companies. A first exploratory incursion in last year’s show has led Super Astro and Su Red to be the Sponsors of this year’s event. The Colombian Federation of Gaming Operators, FECEAZAR, will hold the II National Congress of Compliance Officers during the FADJA show with the participation of Coljuegos. Additionally, trades organizations FECOLJUEGOS and CONAZAR will participate actively in the workshops and conferences, which will be attended by their members. Global industry leaders showcasing at FADJA 2014 include NOVOMATIC, through subsidiary AGI Gaming Colombia, Aristocrat, Bally, Ainsworth, SHFL, Cammegh, Spielo International, GTECH, WMS Gaming, BOSS Gaming, Casino Technology, GAMBEE, Inspired, GLI, Automated Transactions, DRGT, Crane Payment Innovations, Axes Network, Blue Five, Dip Diseño, Odrex, Golden Race, Super Logros, Kupidon, Alfastreet, Mundo Video, Casino Stereo, Super Tek and MexVSR, amongst others.